The above info came from InuSis and atomofish, and was edited by yours truly (contact me). The image came from Amazon.com. There is a street where no one lives, where lights are on but nobody is there to light them. It is where kids go to play hide and seek in white cat masks after dark, and where those kids are sometimes taken by demons and disappear forever. Tonight, a boy named Hikora joins the game to look for his sister Sorincha who has gone missing after she went to play the game. In this abandoned part of town the kids play a game called O-to-ko-yo. The game is played by seven kids having to find their way with neon lights to guild them to O-to-ko-yo square. The doors leading to this creepy area glow with orange characters that read "Demon City". When Hikora arrives he befriends another boy named Yaimao; and along with Hikora a new girl shows up. Hikora belives that she may be his missing sister, and when he and Yaimao try to catch her she remains out of their reach. As the strange statues throughout the Demon City seem to come to life, the game takes on a much more terrifying feel. 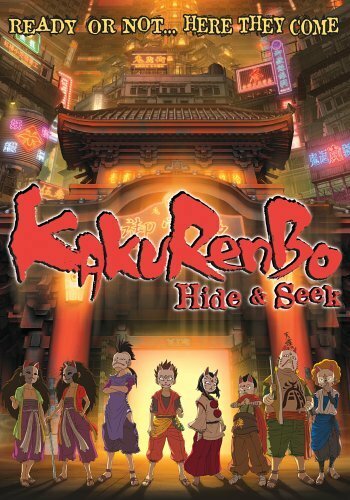 Kakurenbo means hide and seek, obviously, and it's about a game that is played in a deserted town which is inhabited by demons. this game is called O-to-ko-yo. In the game of O-to-ko-yo, there must be seven players, and each one must wear a fox mask in order to play. It's no ordinary game of hide and seek, though, as the demons that dwell there can smell kids and come to get them. In the game, the whole town becomes a maze, but if you can find the signs of "O", "to", "ko", and "yo", you'll find your way... but that's not easy with all the demons after you. Anyway, a boy named Hikora plays the game in search of his missing sister, Sorincha, and is accompanied by Yaimao. There is also Noshiga and his group and the two mysterious twins, Inmu and Yanku, who never speak. But then there is a girl, too, but with her there it makes eight players and there are only supposed to be seven. There are four demons: the Liver-Taker, Blood-Taker, Oil-Taker, and Child-Taker. The above description came from InuSis, and was edited by yours truly (contact me). In this Japanese variation of hide and seek, Kakurenbo takes place in an old ruined city, there's a game that can only be played by children called "Otokoyo." It is rumored that children who lose at this game disappear without a trace. The game involves children putting on different masks while trying to avoid 4 demons that are trying to capture them. And it's at this old city where they decide that it would be the best location for this mysterious game. A group of kids partake in Otokoyo, while one of the players enters the game in hope of finding out what happened to her sister that vanished during one of the games. However, why the children partake in such a game is a mystery. And the mysterious forces behind Otokoyo is a much bigger one.